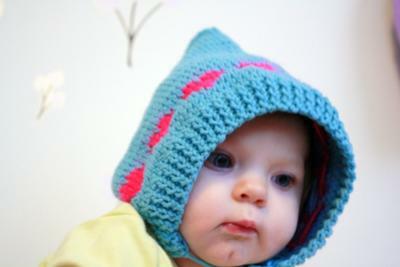 The pixie hat is a classic baby knit that every knitter should make at least once. 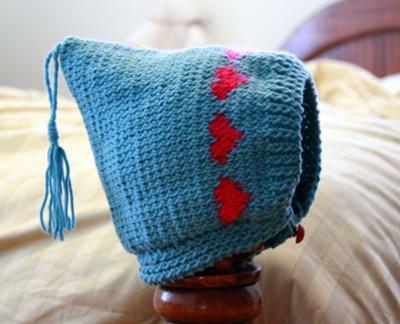 It’s simple, timeless and can be worn by girls and boys depending on yarn color choices. I used Lionbrand Cotton-Ease in Seaspray for the hat, Stitch Nation by Debbie Stoller Full o’ Sheep in Peony for the hearts, and I used size 6 needles. I used this yarn because it was leftover from other projects. That’s the great thing about knitting for little ones – it doesn’t take a lot of yarn…or time! The pattern I used is from Hadley Fierlinger’s book Vintage Knits for Modern Babies. I added the heart pattern myself to give it a little personality. This pattern was simple and easy enough for even a new knitter since there are no increases or decreases. It is straightforward and if you know how both knit and purl, this pattern will be a breeze. It took me one evening of knitting to complete. 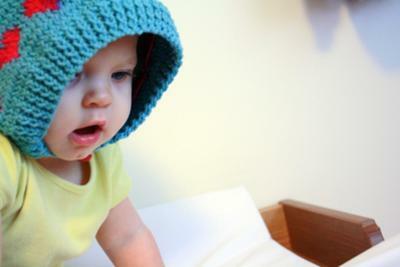 I love this hat on my little girl – it’s cute and will fit her for a while since I made it a little on the big side. super cute. i love the hearts and the style. absolutely adorable.